The Blue Badge parking scheme offers parking concessions to people who have severe walking problems, and consequently struggle to use public transport or walk very far from their car. Displaying a Blue Badge in your car window allows you to park your car much nearer to your final destination to make things easier for you. Where does the Blue Badge entitle me to free parking? They entitle owners to free parking in many pay-and-display car parks and may also mean that you’re not subject to the same parking time limits as regular car park users. You can also park on single and double yellow lines for up to three hours. In Wales, a Blue Badge often lets you off paying at toll bridges, and also allows you free travel across the Severn Bridge crossings. The Blue Badge scheme exempts you from the London congestion charges as long as you register with Transport for London (TfL) at least ten days before travelling. You’re also required to pay a one-time registration fee of £10. The TfL website has a form that you can fill in. Blue Badges can be used in some EU countries and some non-EU countries. The Institute of Advanced Motoring (IMA) has a booklet about using the Blue Badge in the EU on its website. 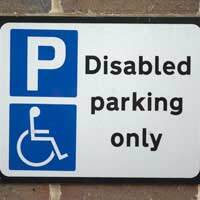 However, there are some places in which a Blue Badge doesn’t entitle you to free parking, including off-street car parks (such as supermarket car parks, which usually have disabled parking bays close to the store anyway, although these aren‘t covered by the Blue Badge scheme) and road systems at airports (in the majority of cases). In Scotland, not all car parks are included in the scheme, so you’re well advised to check before parking, and not all town centres are included either. They are usually issued by your local authority, so it’s best to contact them for more details and to request an application form. Once you’ve been sent an application form, you’ll need to send two passport-sized photographs back with the completed form. You may also need to send accompanying certification, although your local authority may request this from your doctor instead. You should hear back within 15 days of the completed application form being received, but this may take longer if certification needs to be requested from your doctor. Blue Badges are valid for three years, at which point you’ll need to renew. You’ll be sent a renewal reminder 1-2 months before the expiry date, along with a renewal form and return envelope. You’ll need to send back the form as soon as possible to make sure that it’s renewed in time. Always display your Blue Badge in your car window if you’re going to be needing to park, as it’s illegal to park in a Blue Badge parking bay without doing so. However, you should remove it from the window when this isn’t the case. This is particularly important if you share your car with other users, who may use the badge as an opportunity to park for free. This is classed as misuse of the Badge, which can result in a £1000 fine and the removal of your Badge. To avoid the risk, you should only display the Blue Badge when you’ll be parking your car yourself. I want to find a company in Central London that will transport my Quingo Sport (Big Scooter) from London Liverpool Street to Kings Cross EuroStar.The one company I did call was extortionately expensive ... £54.00 for 1 way, when you live on a disability grant and do not have excessive funds to throw at people, this helps to make disabled travel alone even MORE expensive than ever.Ridiculous. Am I expected therefore to drive the scooter the long arduous way from Liverpool Street, trying to navigate horrible side streets and hoping not to get lost, because there is no other way to get between the two points?This is disgusting and I am horrified that a "first world" country like Britain penalises solo-disabled people who do not have loads of money to chuck about.